In one night all the chickens in these different places would be taken. On one of these expeditions, just before daylight while on his way home he met Kawauhelemoa, a supernatural being who had the form of a chicken, who enticed him on until he was discovered by the guards of Olopana. When ʻOlopana heard that it was Kamapuaʻa that was robbing the hen roosts he sent word to all the people from Kahana to Kaluanui to go after Kamapuaʻa and bring him on their backs to his presence. The people who were sent on this mission numbered about eight hundred. When they came to Kamapuaʻa, they took him and bound him with ropes, then placed him on a pole and carried him. At Kaluanui, Kamapuaʻa heard about ʻOlopana’s preparations for battle, so he made plans to escape before ʻOlopana and his men arrived. Kaliuwaʻa is a very high cliff, impossible to climb up or down since there is no trail. The cliff is about two thirds of a mile high. 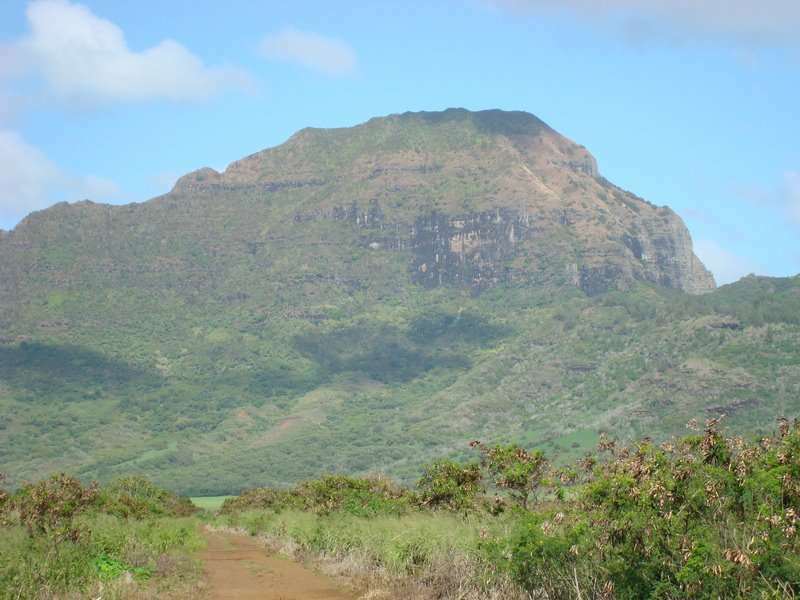 Against this cliff Kamapuaʻa leaned forward and stretched his body to the top to provide a way for his parents, his older brothers, his grandmother, and their servants to escape with all their possessions. When ʻOlopana and his men arrived at Kaluanui, Kamapuaʻa wasn’t there. ʻOlopana then searched for him , finally ending up in Waiʻanae where ʻOlopana and his men settled. However, he still couldn’t capture Kamapuaʻa because he didn’t have a kahuna (priest) to direct his efforts. Lonoawohi (aka Lonoawohi) was ʻOlopana’s kahuna when ʻOlopana became king of O’ahu; however, Lonoawohi had been removed from office, bound with ropes, imprisoned, and sentenced to death for a transgression against the chief. ʻOlopana carried out Malae’s instructions and laid the offerings before Kamapuaʻa – Kamapuaʻa became weak and feeble. The men then seized Kamapuaʻa and dragged him to Pahoa in Waiʻanae, where Lonoawohi was bound and fastened to a post. ʻOlopana intended to sacrifice him with Kamapuaʻa. The men carefully carried Kamapuaʻa to ʻOlopana’s place and put him in the heiau. That night Lonoawohi slept at the post to which he was tied, his sons with him, while the guards kept watch around the house; and Kamapuaʻa slept in the heiau, also under guard. Late that night Lonoawohi prayed, and at the close of his prayer, the ropes which held him fell from his body and he rose and walked out of the house, where he found the guards all asleep. When he arrived at the place where Kamapuaʻa was being held, he found the guards asleep. The meaning of the request was this: Lonoawohi wanted all the lands containing the word “wai,” such as, Waiʻanae, Waialua and so on. Lonoawohi knew, through his great powers, that ʻOlopana would be killed, and that Kamapuaʻa would conquer and possess the island of Oʻahu. This was the reason he made this request. After this exchange between Lonoawohi and Kamapuaʻa, the kahuna returned to his place and sat down. For the rest of the night, he prayed to his god because at dawn he was to be placed on the sacrificial altar with Kamapuaʻa. In the morning ʻOlopana and the priest Malae began the ceremonies performed before a human sacrifice was offered. The two went and climbed onto the terrace (ʻanuʻu) of the sacrificial stand (lele) and prayed; before the prayer ended, Kamapuaʻa rose above them and opened his eyes. When Malae and ʻOlopana saw Kamapuaʻa standing above them, they froze with fear and awe. Kamapuaʻa prayed and invoked his many bodies and all his gods. At the close of the prayer the heiau was surrounded by the gods and pigs. Kamapuaʻa then called out to the priest Lonoawohi . Koʻolauloa moku is further divided into a number of ahupuaʻa – (north to south) Waimea, Pūpūkea, Paumalū, Kaunala, Waialeʻe, Pahipahiʻālua, Nāʻopana 1, Nāʻopana 2, Kawela, Hanakaoe, ʻŌʻio 1, ʻŌʻio 2, Ulupehupehu, Kahuku, Keana, Malaekahana, Lāʻie 1, Lāʻie 2, Kaipapaʻu, Hauʻula, Mākao, Kapaka, Kaluanui, Papaʻakoko, Haleʻaha, Kapano, Pūheʻemiki, Waiʻono, Punaluʻu, Kahana, Makaua and Kaʻaʻawa. Hauʻula is the subject of this summary; it lies approximately midway in the extent of the Koʻolauloa moku. 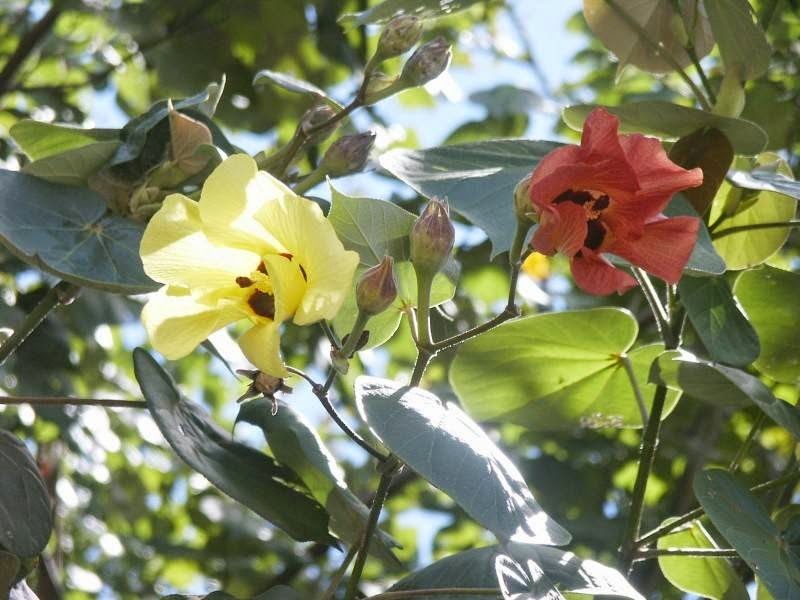 Its name refers to a native hibiscus, the hau; it blossoms during the summer months. Its flowers are bright yellow when they open in the morning, but turn red by the time they fall to the ground. (Lit., red hau (flower.)) (Pukui) By sunset in July and August, Hauʻula is ablaze with the deep red color of hau flowers. 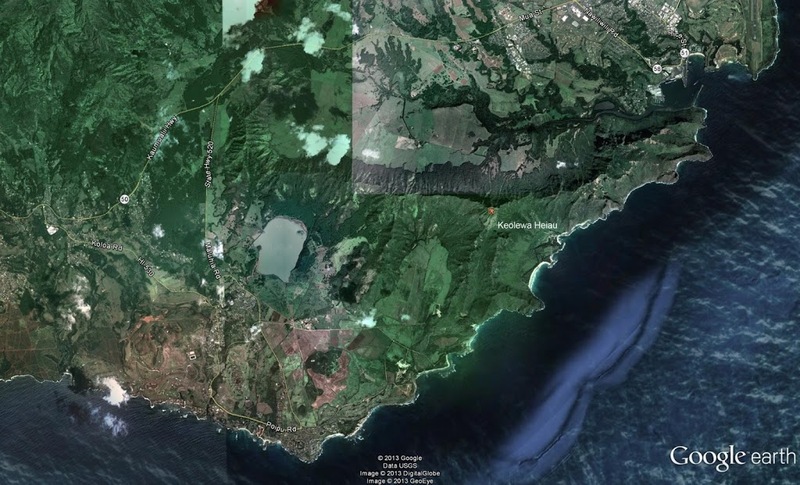 As early as 1904, the Territorial Government enacted legislation setting aside lands in Koʻolauloa as a part of the newly developing Forest Reserve program of the Territory. James Castle moved to connect the OR&L rail line in Kahuku with the proposed street railway system in Honolulu by way of the Windward Coast. 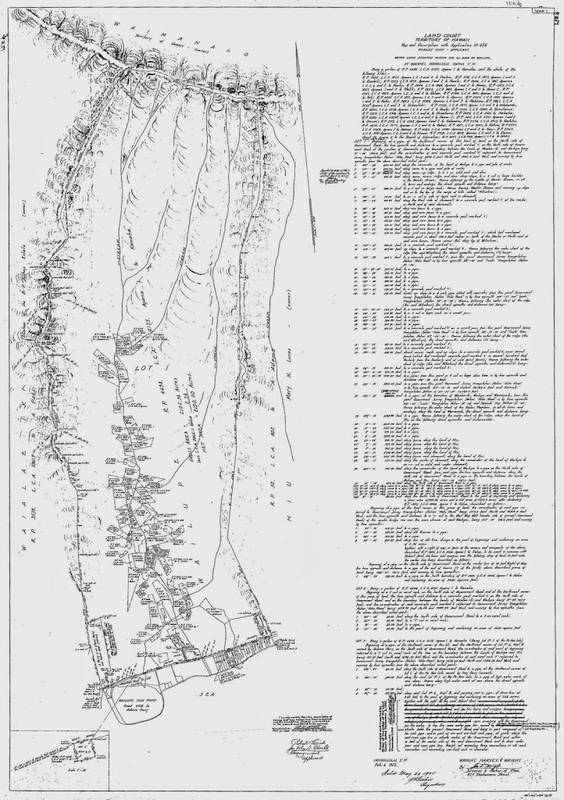 His plan was to extend his Koʻolau Railroad Co south of Kahana Bay through Kāneʻohe and Kailua, and on to Waimanalo where it would go through a tunnel and into Manoa Valley and connect with the Rapid Transit & Land Co.
Two curious formations called by the Hawaiians waʻa, or canoes (hence the name, Kaliuwaʻa, the valley of the canoe,) are quite striking. They are semicircular cuts in the cliff, extending from the base to the top, like the half of a well. Kamapuaʻa was accused of eating ʻOlopana’s chickens. ʻOlopana, chief of O`ahu, decided that he must apprehend the hog-thief, so he called to all of Oʻahu to wage war against Kamapuaʻa. Kamapuaʻa heard of ʻOlopana’s plans and took his people to Kaliuwaʻa, where they climbed up his body to the safety of the cliff top. In doing so, Kamapuaʻa’s back gouged out indentations on the cliff-side that can still be seen today. Kaliuwaʻa (often called Sacred Falls) is regarded as sacred for its association with the deity Kamapuaʻa, but the name Sacred Falls is a relatively recent phenomenon. Forms of the name first appear in historical documents in the 1890s, where the valley is called Sacred Ravine. The image shows the hauʻula, the native hibiscus for which Hauʻula is named. In addition, I have added other related images in a folder of like name in the Photos section on my Facebook and Google+ pages.